Contact one of our Business Gift Specialists at 877-233-9000 for more information about personalizing this gift. The Grand Premium Delights Gift Tower makes an impressive gift—especially since the hand-tied bow can be personalized with your corporate logo, adding a finishing touch to this tower of elegant gift boxes. 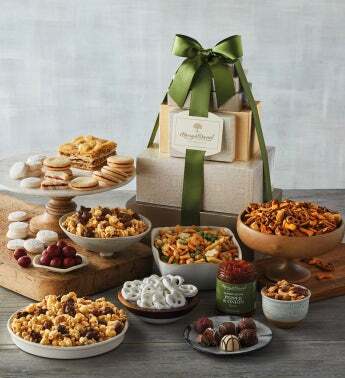 It's a great gourmet gift for the office or to send to business associates and clients. With seven golden-wrapped boxes full of savory and sweet treats, there's bound to be something for everyone. From the Moose Munch® Gourmet Popcorn crafted in our Southern Oregon candy kitchen to our famous pepper and onion relish, signature baklava, buttery raspberry galettes, assorted truffles, and super party trail mix, this tower is a memorable way to say thank you, send seasonal greetings, or give kudos for a job well done.